The Nova Scotia provincial election on October 10th saw Stephen McNeil’s Liberal party sweep to power capturing 33 seats to form a majority government. The NSNDP was relegated to third place with a paltry seven seats, the lowest for the party since 1993. Even Darrell Dexter, the sitting premier, lost his own seat. This is the first time in 131 years in Nova Scotia that a governing party has failed to win a second mandate. The election for the NSNDP by any measure was a crushing blow. The question the left should be asking itself is why this happened and more importantly, what are the lessons we should be learning from this defeat? To do this we need put this election and the NDP under the microscope and examine them at different levels. Upon first inspection we see most commentators drawing up a list of credits and debits as an explanation of the defeat. The NDP cancelled the ferry in Yarmouth, they upset students with the NSCAD debacle and by allowing tuition increases to take place, they handled the expense account scandal poorly, they raised the HST, but they lowered small business tax, created first contract arbitration, promised to reduce clear cutting by 50 percent, made a number of progressive steps in the healthcare system, such as increasing access to dental coverage and instituting fair drug pricing (but had no big central piece of legislation). This level of analysis is of simple records and promises. It does not explain the broader political terrain. What it does tell us, though, is that the first NDP government in the province was not outside the dominant political discourse of the day. The NDP placed a big premium on balancing the budget, during the election campaign they even slammed the Liberal’s plan for returning the province to deficit budgets. Don’t get me wrong, there are important differences between the NDP and the previous Liberal and Tory cabal that ruled Nova Scotia. One would have to be a willfully ignorant ideologue of the left to erase that nuance. The NDP were different, just not radically so. The party’s base and history means that the NDP is not subjected to the exact same types of political pressures as the other parties. The NDP in power presents a different type of calculation when weighing the balance of social forces (especially the labour-capital balance) in the province. This is all to say that when the NDP came to power, they were riding a wave of expectations that they would be something different. Rightly or wrongly in 2009 people read into the NDP a possible new or fundamentally different way of both governing and organizing society along human needs. Now, I am not saying that people had expressly socialist expectations and were disappointed, rather that in the midst of the disjuncture of the great recession people were thirsting for alternatives, however vague. One should be careful with an analysis like this though, it can lead to the mistaken conclusion that the competent NDP government had been cursed by high expectations. Stephen Kimber, a local journalist, presents an argument along these lines, while he is more or less correct in his overall appraisal of the electorate, it can read as though the NDP did little to deserve its fate. If only they had communicated their successes better. This line is also repeated in Christopher Majka’s latest piece for rabble.ca about the NDP loss. Majka and Kimber here let the NDP off too easy, it wasn’t just poor communications and overly high expectations that did the NDP in. This is to miss the deeper points about the poverty of social democracy in our age. So let’s leave behind for a moment this world of political jockeying and increase the magnification of our analysis. It begins with the question of why the NDP was so unable to be anything other than the most tepid of social democrats? Our answer must begin by looking at the NDP and organized labour. The NDP is by and large supported by most of the labour movement in Nova Scotia (with some notable exceptions, such as the Nova Scotia Teachers Union which supports the Liberals). Even though the NDP ended corporate and union financial support for political parties, unions are still the most significant organized component within the NDP’s orbit. If unions did not mobilize their members to push for the NDP there is absolutely no way the party would have formed government. So why did the union movement get so precious little from the NDP while they were in power? The NDP only passed first contract arbitration in 2012. They also at the same time made some minor adjustments, basically technical in nature, to the labour standards code. None of this was particularly bold. People within the labour movement were hopeful that we may get card-check, which allows for unions to be formed when a majority of workers sign union cards, as even the vacillating Ray government in Ontario introduced that. Or perhaps the NDP would purge the Tory appointees at the labour board and replace them with either labour friendly folks or at least people with a marginal degree of competence. There was none of that. Nor was there a major jobs creation program, other than the government handout to the ultimate welfare queens, the Irving family, to get the shipbuilding contract in Halifax. The NDP didn’t really step up to the plate for labour. The reason why this happened was not because the NDP failed in its duties, rather that labour did not seize the opportunity to push the NDP into doing something more. 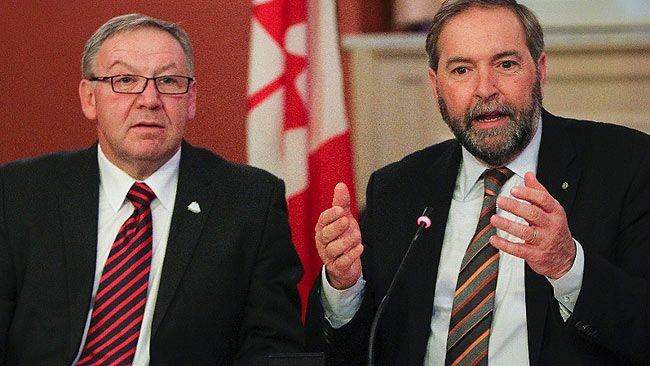 Certain labour leaders have had long and intimate relations with the NDP in opposition. These relationships were carried over when the NDP formed government. Thus, an insistence on bringing forth legislation such as card-check would be quelled with an understanding word: we would like to, but now is not the time, second term. This culture of quiet complicity meant that labour was caught in the bind of not rocking the boat (of course there was a difference of opinion within labour where some leaders and activists fought for a bolder path). Just look at what happened with the recent debacle of taking away the paramedics right to strike. The government passed legislation that stripped the paramedics right to strike from them this past summer without declaring them an essential service(paramedics work for a private company). A powerful fraction of the labour leadership in the province either overtly or tacitly supported this coercive measure. The President of the Nova Scotia Federation of labour Rick Clarke and Joan Jessome, head of the largest union in the province the NSGEU, even publicly backed the NDP’s legislation. The point here is that if the NDP were to tip the balance of power in favour of working people in the province, it required a push. A comrade of mine in the labour movement is fond of using the example of France’s popular front government in the 1930s. You elect a progressive popular front government, what do you? Make backroom deals? No, you strike day one! This should be the perspective that is adopted by both labour and social movement activists. But the question is how do you do that? It is at this point we again must place our analysis under the microscope and take an even closer look. The NDP governed with barely a hue of traditional social democratic vision and a sizeable fraction of labour leaders did not overtly pressure them to do otherwise. It would be truly baffling though if the NDP and labour leaders struck a bold path in the absence of severe pressure from below. It is at this molecular level of social movements that we must understand the balance of social forces in Nova Scotia. The left, anti-capitalists and left social democrats, going into 2009 were in complete disarray. There was an utter lack of vision for an alternative on the left and more importantly no real organizations to fight for one. This meant that the NDP did not have to deal with a left flank, which I think goes a long way in explaining how the NDP governed. This was especially important when the NDP came to power, as they immediately had to navigate a severe global recession. Traditional social democratic solutions were not an option. For those readers who have known only neoliberalism, social democracy at a certain time in history offered some modicum of political vision that largely centred on increasing the welfare state, having higher taxes and undertaking the nationalization of key industries. Social democracy was not a direct counter to capitalism but had a politics that put a more equitable distribution of wealth on the table. But for the NSNDP policies such as nationalizing utilities, rent control, real money for expanding housing co-ops, big investments in green infrastructure, ending corporate handouts and so forth were never really an option. Even some of their very modest social democratic proposals put forth by the NDP in opposition were left by the wayside in government. The inner party life when the NDP formed government shifted to the right fairly quickly. Howard Epstein, the left most MLA was shut out of any cabinet position and was quickly silenced after publicly opposing the NDP’s support for the P3 funding of the Halifax convention centre. Obviously there are good committed activists who work within the party but their ability to truly effect political change and win fights within the party was and is limited. The left’s orientation towards electoral politics should be driven by a collective strategy that varies with the given context. Obviously elections will not bring about the changes we need, but tactical interventions can at moments bring about reforms that make it easier to organize and grow the left and working class power. For instance, card-check can add union members, nationalizing Nova Scotia Power or getting money into funding housing co-ops can structurally shift debates about public ownership and affordable living. With the NDP out of power the ability to fight for strategic reforms will now be much harder. So at this atomic level of social movements what is the left to do? Compared to 2009 the left in Nova Scotia is more organized and active. It is, however, still quite small. The level of social struggle in the province is not at a high point. But social movements go through boom and bust cycles. The incoming Liberal government, even though they talked left during the campaign, will undoubtedly shift the political terrain to the right. This may reignite fights over such things as affordable housing, healthcare delivery, and job creation. The NDP is now out of power and not looking like they will be returned anytime soon. There is nothing to suggest that those deeply entrenched in the party will learn a lesson about not being left enough. In the past couple of years certain parts of the left in Nova Scotia have awoken to the fact that the NDP, even if they are the preferred option in power in the short-term, are incapable of initiating meaningful change. The left should be upfront, but not sectarian, with its critiques of the NDP and of social democracy in general. The economic crisis of 2008 only exacerbated the pressures of the current neoliberal economic paradigm, which has rotted out the core of social democratic politics over the past 30 years and left a husk of meaningless buzzwords. The NDP defeat should put rebuilding the left from the bottom up squarely on the agenda for activists in the province (and should be a lesson learned across the country). We need to grow the power of social movements, empower the rank and file within unions, and strategize how the left can navigate the tension of building broad based movements, while still presenting a political and social vision that is different from the reigning neoliberal worldview. The left’s main task now should be to build vibrant and democratic organizations that are capable of enunciating and implementing political strategies and bringing forth much needed debate. They should aim to provide political clarity and organizational capacity. This means being strategic when confronting the electoral system, trying to find places and moments that expand people’s power. The NDP are nothing but a stop-gag solution, especially considering the weakness that existed to their left for decades. Thus, their defeat, while a set back for the left and workers in the province, doesn’t alter the task of the left in our current period:organize! organize! organize!